Based on our experiences, these are good resources or services. All Green hyperlinks, images or banners will take you to products we use and recommend. You can vacation in Ireland the typical way, on a tour bus, or you can go the way we do, by car with a little faith and a sense of adventure. Ireland is made for the adventurous tourist, there is a B&B on every corner and a new site to visit over every hill. Be brave, support Ireland and take a chance. B&Bs are by in large good everywhere, you can call ahead and get recommendations or get a list on the web ahead of time (your best bet). We recommend booking your first few night and your last few night and leave it to chance in between. There is so much to see in Ireland that if you just wander, you'll be happier and have a lost less stress than following an agenda. Ask the local where to go, pick up guides along the way, improvise and be flexible, go to local events, spend an extra day in places you like. There will be more memories, happier days and more to look forward to on your next trip. Another approach is to book a week in two or three locations depending on your length of stay (less than two weeks is insane and three weeks is barely adequate). Ireland is a small country and you can cover a lot of territory from a central location. Personally we recommend Dublin for a week to 5 days. Wicklow for a week to 5 days. Cork for a week (or 5). Kerry for a week (central to Ballyferriter). Clare for a week (or two) central to Kilfenora. Galway for a week central to Spiddal. Your mileage may vary, but you can't go wrong with these as a start. Dublin is a big city and while fun, a week can wear thin. Consider day trips out to Glendalough, Monstasterboice/Mellifont, Trim and Kells. Wicklow has Glendalough, Avoca (home of Ballykissangel) and many mountainous sites the are unique to Ireland. Cork is a large county. So much to see, so little time. You could spend 5 weeks here and barely tap the depth. The obvious sites are in the central part. Think about the remote site. we loved Baltimore, Schull, Sheeps Head, Mizen Head and most of all the Bearra Peninsula and Castletownbere. Make sure you visit Jack Patricks there for a wonderful meal and a good overview of the area. Kerry is varied, the Ring of Kerry is highly touted and very beautiful, but the Dingle Peninsula is our preferred stop and the Ballyferriter area is a perfect central location. The is more to see in the Dingle area than you can cover in 2-3 weeks. Clare is incredible. Largely overlooked and underrated. If you love antiquities, wild scenery, diverse landscape, traditional music, wild coastlines, rocky ruins, little traveled locations, Clare is the place for you. Please see our travel journals, especially 2007 for more detail. I take a good many pictures when I travel to Ireland. I've used point and shoot , to larger fixed lens cameras to DSLR s. My mileage varies as will yours. The trade off is portability vs. image quality. The point and shoot fits in your pocket or small bag, but you won't get the nice interior shots in low light that you can with a DSLR . Of course you could be a tourist and use the flash, blinding everyone in the pub and disturbing the poor musician causing him to drop the family fiddle onto the flagstone floor. OK, you don't want to be that guy (or gal). Learn how to use your camera, turn off the flash and bump up the ISO setting. Here are a few cameras that I either have or want to have when traveling. Read the reviews, think about what kind of pictures you like to take and get what works for you! Highly rated weather proof and waterproof camera. Perfect for those soft Irish days or a tropical beach excursion. Very nice performance inside our outside. Will take great pictures in the pubs. Canon makes some great gear. This one is a solid performer across the board. The next best thing to a DSLR. The best option to get your feet wet in the DSLR world. The top end of the Nikon line without paying an arm and a leg The next step up is into the Pro line. 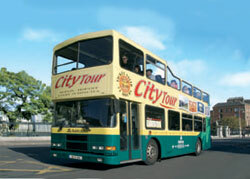 If you're traveling to Dublin and want to get around downtown and see the major sites, get a City Bus Tour pass. You can purchase it for less on line and pick it up at their office. It is easy to find. City Bus Tour is cheaper than the regular bus and faster to get to the sites you'll want to see. You can get on and off the bus at marked major sites and buses come by quite often. The driver has a running narrative which can be quite informative and amusing. Make sure you pay attention to what color bus you get on. There are red ones and yellow ones, don't mix them up. City Bus Tour buses are yellow. Most buses are double deckers and sitting up on top can be fun if you're taking a longer ride and the weather is good. It is hard to get off when you have to go down the stairs and to the front to disembark. They also have a Dublin Pass for access to sites. We didn't find that the Dublin Pass was a good buy for us, but it might work for you. You can pick up the passes at their office on O'Connell Street just up from the General Post Office (GPO). 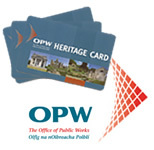 Buy a Duchas Heritage Pass card. You can buy the pass online or at any of the sites. It gets you into about 65 sites and saves a lot of money if you're visiting heritage attractions. You get a book with the pass that shows the site locations and a description of each location. You can view the list of sites here. The Duchas Heritage Pass is about 21 Euro per person. Senior and family rates are available. Rent your car from Irish Car Rentals online prior to leaving, it is cheaper and easier than negotiating at the airport. Get a manual shift if you can drive one, they are a lot cheaper than an automatic. Make sure you allow for people and luggage in your vehicle choice. Get the smallest car possible, the roads are narrow, but make sure you are comfortable and have room for your luggage. We found the Opel Zefira to be a good choice when traveling with older people. It is easy to get in and out of and holds a good deal of luggage. It sits up a bit higher than a car allowing for better visibility. Read independent travel reviews about vacation destinations worldwide! Get a map of Ireland, city maps are helpful too, especially in Dublin . It may not help, but at least you'll see where you should be. We live and die by our multi-paged atlas. It doesn't show all roads, but enough to get around the back ways. ATMs are fairly plentiful in populated areas. Take larger amounts of cash out to avoid additional ATM or bank charges. Check with your bank before you go as to additional charges. We found a Credit Union with no charges for currency conversion, you should too. Using your phone's GPS, especially if it is connected to Google maps can help you locate yourself when lost and often guide you to sites that you can see from the air, but not the ground. It is also useful for finding roads to sites that are not marked, but you can trace you way to a main road. Other options are an iPod touch or iPad . Both can store GPS maps via the MotionX apps and don't require being connected to view the map. The Photographer's Ephemeris app is indispensable for determining lighting conditions and planning photo activities. Take the boats to the Islands. Blasket, Skelligs, and Aran Islands are all worth the trip. The boat trip from Doolin to the Aran Islands results in a rough ride. Don't take it unless you have a strong stomach and/or motion sickness pills. 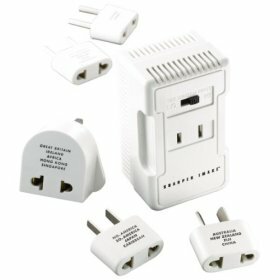 Take a travel adapter for your electronics when traveling from the US to Ireland. Irelands electricity supply is 220 volts at 50hz, whereas the United States uses 120 volts at 60hz. Make sure that your electronic device can switch to accommodate 220 otherwise you'll need a travel converter (most include one each of the different adapters).